In its renewal of the Homelessness Partnering Strategy (HPS), the Government of Canada has prioritized Housing First as a key strategy to reduce homelessness. A Housing First approach focuses on moving people who are experiencing chronic or episodic homelessness as rapidly as possible from the street or emergency shelters into permanent housing with supports to maintain housing stability. 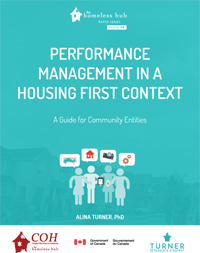 This Guide to performance management was developed specifically for Community Entity (CE) organizations to help manage HPS funding, as performance management is essential to understand the effectiveness of interventions funded under HPS, as well as a community’s overall progress towards reducing homelessness. It is important that communities develop effective performance management processes to link their efforts to national-level goals and benchmarks. Informs the next round of strategy review and investment planning. In this online Homeless Hub document, Steve Gaetz discussed key tenets of Housing First. This web-based toolkit provides step-by-step guidance on the development and implementation of Housing First programs, aimed for service providers. This document produced by the Calgary Homeless Foundation outlines the system of care in place in Calgary. It offers a practical application of system planning from the CE perspective. This Calgary Homeless Foundation advisory outlines expectations from the CE on referrals and eligibility in funded programs using a system planning approach. This link provides information to the Calgary Acuity Scale tailored for youth, families, and singles- used across homeless programs to determine level of need. This link provides an outline of the Denver Acuity Scale (see Appendix A of the document). This link outlines the tenets of the Service Prioritization Decision Assistance Tool (SPDAT), another acuity assessment tool. This link provides information on the Homeless Individuals and Families Information System (HIFIS). This link provides information on the Calgary’s Homeless Management Information System. This document presents the CHF privacy impact assessment, accepted by the Alberta Privacy Commissioner to operate HMIS. This document outlines the CHF HMIS operating procedures in specific detail, along with key data collection and consent forms, data sharing protocols, privacy audit functions. These documents provide reporting examples from Medicine Hat Community Housing Society. Information submitted is corroborated with data, direct observation, or review of case files from the CE. For example, the Rapid Rehousing Data Spreadsheet is cross-referenced with data in the integrated information management system. If there are inconsistencies, it is caught immediately by staff, and then assistance provided to the teams to correct the information. The programs also need to submit written monthly report. The MHCHS Rapid Rehousing Monthly Report contains information that is cross-referenced with financial statements. For example, if there are high rehousing costs in the financials, and no client was rehoused that month based on the written report and spreadsheets, an explanation is requested or their detailed General Ledger. This example of a program dashboard shows how the Calgary Homeless Foundation uses HMIS to assess performance on a quarterly basis. This is the City of Hamilton’s tool used to collect demographic, qualitative and outcome data from funded agencies. It is submitted on a monthly basis. Staff aggregate the information on the back end to assist the CE with community planning initiatives and completing HPS results reporting. These are the national-level indicators provided by HPS to designated communities across Canada. Edmonton Homeward Trust’s document presents the service quality requirements for funded programs, as contractually required. The Canadian Accreditation Council and CHF’s Case management accreditation manual outlines the standards of practice across Housing First programs that provide case management. This is a schedule for contracts with Edmonton Homeward Trust that outlines required service expectations. Homeward Trust has developed a slate of comprehensive policies for funded programs, as outlined in this manual. These are the set of Policies and Procedures which govern the Transitions to Homes (T2H) program, Hamilton’s HPS-funded Housing First program for single chronically homeless males. These documents outline various organization’s tools for site visits and ongoing monitoring. They include preparatory materials for CE staff conducting site visits, as well as actual monitoring checklists and questionnaires. The City of Hamilton’s Transition to Home, run by Wesley Urban Ministries, has a Consumer Advisory Group in place. This document presents their Terms of Reference. The Group comprises mainly persons with lived experience as an internal advisory and planning committee. The language within the TOR is intentionally kept straight forward and direct. The committee has been in place since the program began and attached are their Terms of Reference. The CHF Client Survey is provided across funded programs by the CE and results are analysed centrally to assess client perception of service quality and impact. This example of client interviews from the City of Ottawa is incorporated in regular monitoring processes. These policies, procedures, and advisories provide examples from various CEs with respect to risk management. They include critical incidents, grievances, safety and privacy related documents. Coordination of Monitoring Practices, Evolution of Payments processes and the Modernization of Program Records. These changes are being implemented in phases, with the aim to be fully implemented by April 2016. This is an early version of the work planning document that outlines the steps being taken to implement the first series of administrative recommendations (listed above) planned to be implemented early in 2014. Various CEs have provided sample Requests for Proposals/ Calls for Applications used to date. Some have also provided supplementary documents on background information to applicants. A sample contract renewal form is provided by CHF, along with background definitions for applicants. A sample contract renewal form is provided by CHF, along with background definitions for applicants.